Interpersonal functioning plays an important role in the onset, maintenance, and exacerbation of psychological symptoms. Over the last several years I have been intrigued by how self and interpersonal processes can be detected in free-response data. As this society values the meta-constructs of Agency and Communion to organize personality, psychopathology, and psychotherapy processes, I am excited to share my research that “expands the circle” to include the cognitive and affective themes present in social exchanges as well. I will first present some of my research, and then discuss how I see it fitting into the themes of Agency and Communion. The Social Cognition and Object Relations Scale-Global Rating method (Westen, 1995; Stein, Hilsenroth, Slavin-Mulford, & Pinsker, 2011; SCORS-G) systematically assesses (via free-response data) multiple dimensions of cognitive and affective processes that mediate interpersonal functioning beyond the overt presentation of the patient (see Stein et al. 2012). This measure integrates clinically based object relational theories with experimentally generated theories of social cognition (Westen, 1995). It is a clinician rated system that can be used to code various forms of narrative material (e.g., Thematic Apperception Test, early memories, psychotherapy narrative as well as clinical interviews). It is comprised of eight constructs (underlying dimensions of object representations), which are rated using a seven-point Likert scale and some of the dimensions have a developmental origin. Lower ratings are indicative of more pathological and primitive aspects of object representations and higher scores are suggestive of more mature and adaptive functioning. Clinicians and researchers can examine individual dimensions, overall composite rating (mean of eight dimensions), and/or component ratings (broken down into Cognitive, Affective, and/or Self; See Stein et al., 2012). The SCORS-G has been used in a variety of contexts in the empirical literature. That is, this measure has been used to discriminate between aspects of personality and psychopathology. Much like the interpersonal model, the SCORS-G has been used in the psychotherapy process and outcome research to elucidate the relationships between object relations, alliance, psychotherapeutic technique, and change. While the interpersonal model commonly assesses Agentic and Communal perceptions and behaviors, the SCORS-G also considers how social-cognitive and affective experiences are integrated into the interpersonal exchange (see also Hopwood, Wright, Ansell, & Pincus, 2013). In a recent study using the SCORS-G, Stein and colleagues (2015) examined associations between SCORS-G dimensions and a wide array of life events (i.e., aspects of suicidality, conduct disordered behavior, drug/alcohol use, and history of trauma) in two clinical samples (i.e., psychiatric outpatient and inpatient) using TAT narratives. Some of the findings were that number of psychiatric hospitalizations and suicide attempts as well as history of suicidal ideation and alcohol abuse were all associated with global pathology (SCORS-G Composite rating). History of suicidal ideation and number of suicide attempts were related to most individual SCORS-G dimensions. These findings suggest that suicidality was associated with more disruption across cognitive, emotional, and self/other functioning than other life history variables studied. Interestingly, history of self-harm was solely negatively associated with identity diffusion. This is consistent with theoretical understandings of self-injury as a way to regulate aspects of self through some external force (Kernberg, 1984) or interpersonal message (Benjamin, 2003). Consistent with the notion that drugs and alcohol are often used as self -soothing functions, outpatients with a history of alcohol and drug abuse both demonstrated lower capacity to invest in other people with interactions being more need driven and less reciprocal, highlighting difficulties with Communion. With respect to the finding regarding history of childhood and adult trauma, outpatients endorsing a history of childhood sexual abuse produced narratives where internal states were more polarized (e.g., good/bad) and there was increased fusion between characters (i.e. less Agentic differentiation). In the narratives of those reporting childhood trauma, characters tended to behave in more inconsiderate and selfish ways exhibiting less remorse. In contrast, patients reporting adult physical abuse tended to depict characters with more remorse and consideration of others. Adults with a history of physical abuse were more likely to produce narratives suggesting difficulties regulating feelings of anger and aggression. Characters were characterized as hostile and aggressive. Overall, this study was able to identify relationships between a wide range of clinically relevant life event variables and SCORS-G dimensions in theoretically consistent ways using TAT narratives. These findings have notable clinical applications in the psychotherapeutic as well as assessment process. That is, understanding the underlying aspects of object relations, which are impacted and/or preserved with certain life events can help guide therapeutic technique as well as therapist stance (including potential barriers to treatment). It is encouraged for future research to examine these life event variables with other forms to narrative data to examine whether similar findings exist and/or if certain narratives elicit underlying dimensions of object relations more/less than others. As illustrated in this study, to maximize the SCORS-G utility, we as researchers are continually striving to conduct studies that can examine how these underlying cognitive, affective, and self processes that mediate interpersonal functioning generalize to individual’s day to day functioning and actual behavior. 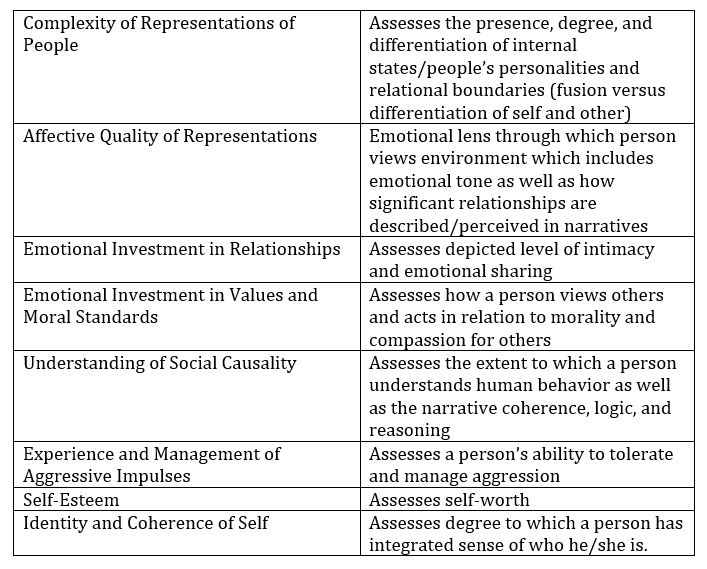 While the interpersonal model and SCORS-G are distinct methods in assessing aspects of interpersonal functioning, there is some potential overlap. That is, both highlight the role of self (i.e., agency) and others (communion) and how mental representations impact interpersonal functioning. Lukowitsky & Pincus (2011) conducted a study examining the role of mental representations (via object relations and attachment theory) in predicting interpersonal adjustment (via Inventory of Interpersonal Problems-Circumplex Scales (Alden, Wiggins, & Pincus, 1990). While they did not specifically use the SCORS-G when assessing object relations, they extensively describe commonalities and differences across these two theories. With regard to the SCORS-G and interpersonal models, one of the differences include how agency and communion are represented. In interpersonal models, this is mainly obtained through self-report measures and directly asking people about interpersonal functioning. The SCORS-G is rated via clinical material and information is obtained indirectly (other people rate dimensions based on psychotherapy, early memory, TAT narratives or clinical interviews). While aspects of self and others are captured in all eight SCORS-G dimensions, it doesn’t examine specific interpersonal style/traits like what is captured by the interpersonal models. Future research would need to be conducted to elucidate the specific relationships between level of agency and communion and the SCORS-G dimensions. One would hypothesize relationships between SCORS-G dimensions Self-Esteem and Identity and Coherence of Self with Agency. Also, SCORS-G Emotional Investment in Relationships, Emotional Investment in Values and Moral Standards and Experience and Management of Aggressive Impulses dimensions would have relationships with Communion, but the extent to which has not been tested yet. Broadly though, I would imagine the SCORS-G dimensions have more of a propensity to represent underlying constructs that can contribute to the development of interpersonal styles as assessed by interpersonal models. In this way, using these measures in conjunction with one another serves to expand our understanding of how mental representations of the self and others impact current interpersonal adjustment. This can serve to enhance our understanding of psychopathology and personality as well as guide clinical exchanges and research practices. Alden, L.E., Wiggins, J.S., & Pincus, A.L. (1990). Construction of Circumplex Scales for the Inventory of Interpersonal Problems, Journal of Personality Assessment, 55, 521-536. Benjamin, L. S. (2003). Interpersonal reconstructive therapy: Promoting change in nonresponders. Guilford Press. Lukowitsky, M.R. & Pincus, A.L. (2011). The pantheoretical nature of mental representations and their ability to predict interpersonal adjustment in a non-clinical sample. Psychoanalytic Psychology, 28, 48-74. Stein, M., Hilsenroth, M., Slavin-Mulford, J., & Pinsker-Aspen, J. (2011). Social Cognition and Object Relations Scale: Global Rating Method (SCORS-G), (4th ed.) (Unpublished manuscript). Massachusetts General Hospital and Harvard Medical School, Boston, MA. Stein, M. B., Slavin-Mulford, J., Sinclair, S. J., Siefert, C. J., & Blais, M. A. (2012). Exploring the construct validity of the Social Cognition and Object Relations Scale in a clinical sample. Journal of Personality Assessment, 94, 533–540. Stein, M.B., Slavin-Mulford, Siefert, C. J., J., Sinclair, S. J., Smith, M., Chung, W.J. Liebman, R., & Blais, M. A. (2015). External validity of the SCORS-G ratings of Thematic Apperception Test narratives in a sample of outpatients and inpatients. Rorschachiana, 36, 58-81. Westen, D. (1995). Social Cognition and Object Relations Scale: Q-sort for Projective Stories (SCORS-Q) (Unpublished manuscript). Department of Psychiatry, The Cambridge Hospital and Harvard Medical School, Cambridge, MA.